If you have long hair you will love braid master. Either simply to keep your hair neat for work with a simple braid. or to explore hair braiding styles. So what is braid master? Simply, look at our picture of braid master. See those slots between the fingers? Now, as you know, creating hair braiding styles is a matter of making separate strands of hair, then weaving them. Those slots let you slot in strands of hair. They are then held separate. And you can start braiding by moving the strands from slot to slot over each other. You can braid your very own hair, as the device is holding the different strands. or treat a friend, child or customer to a new look. Simple braids can be done quickly giving you more time. 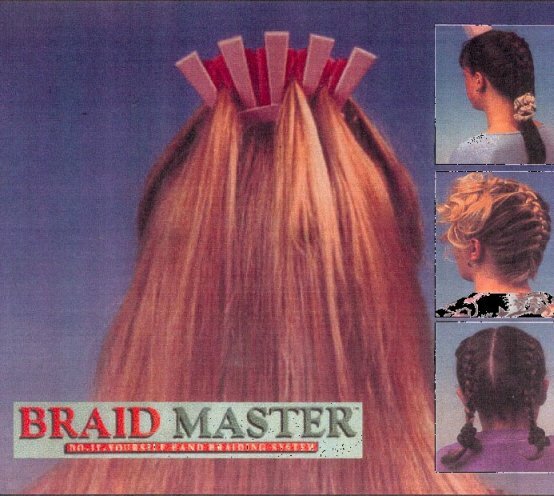 Two braid masters are included so it is like having two extra pairs of hands. The telephone goes or you fancy a snack, no problem the strands are held in order as well as the unfinished braid. You can also add more than one strand of hair to each braidmaster slot. We are talking about the ability to do very complex hair braiding styles where many strands are involved. Creating french braids involves five different strands of different thicknesses. With braid master gripping the strands in an organised way, you will only have to hold and move one strand at a time. Which strand is where is clear, and you are not juggling as you create the french braids. Suddenly french braiding becomes a lot less difficult. The braid master comes as two braidmasters and a Pal video which demonstrates many hair braiding styles. Braid master speeds up simple braids and makes complex braids easier. You will love braid master. Note: Most videos can play PAL format video like the free braid master video, UK videos are fine, but elsewhere, check your video before ordering. hair braiding styles text, images and video are copyright.